Sunday April 23rd 1893 I was buys about the work all the forenoon and in the afternoon we went over to Marys and up home awhile. Ott & Fanny went over and stayed till after supper. Will and I went to church. 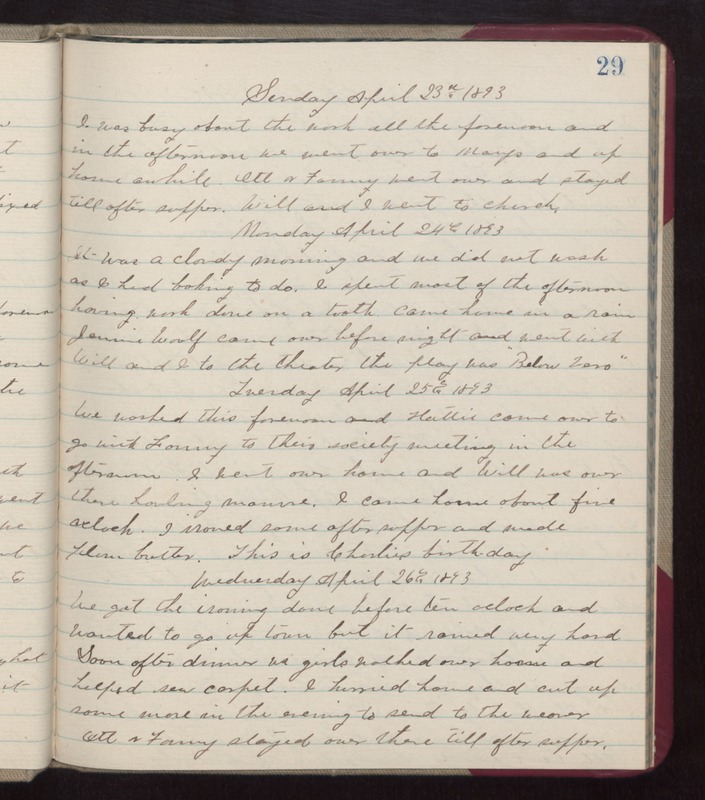 Monday April 24th 1893 It was a cloudy morning and we did not wash as I had baking to do. I spent most of the afternoon having work done on a tooth. came home in a rain Jennie Woolf came over before night and went with Will and I to the theater the play was "Below Zero." Tuesday April 25th 1893 We worked this forenoon and Hattie came over to go with Fanny to their society meeting in the afternoon. I went over home and Will was over there hauling manure. I came home about five oclock. I ironed some after supper and made plum butter. This is Charlie's birthday. Wednesday April 26th 1893 We got the ironing done before ten oclock and wanted to go up town but it rained very hard. Soon after dinner us girls walked over home and helped sew carpet. I hurried home and cut up some more in the evening to send to the weaver. Ott & Fanny stayed over there till after supper.